Figure 1. Location of Rio Grande River and Rio Grande drainage basin. The Rio Grande River heads up in the eastern San Juan Mountains of southern Colorado and flows nearly 2000 miles to the Gulf of Mexico. It is the second longest river in the U.S. and for 2/3 of its length it forms the boundary between the U.S. and Mexico (from El Paso, Texas/Ciudad Juarez, Mexico to the Gulf of Mexico at Brownsville, Texas). Since its waters are utilized by three states and Mexico, the Rio Grande is considered an interstate and international stream. The Rio Grande Basin includes an area of over 350,000 square miles. The Rio Grande River supplies drinking water for about 10 million people in a semi-arid region. Approximately 98% of the precipitation that falls in this region evaporates! Rio Grande waters also are used for agricultural, recreational, hydropower, and industrial purposes. The principle use water throughout the Rio Grande Basin is for irrigation. Major population centers along the Rio Grande include Albuquerque, Sante Fe, Las Cruces, Rio Rancho, Los Lunas and Belen, New Mexico, El Paso, Texas, and Juarez, Mexico. Population growth of about 150% is expected to occur in this region between now and 2030. The U.S. and Mexico share the waters of the Rio Grande under a series of agreements administered by the Joint US-Mexico Boundary and Water Commission. The most important of these agreements were signed in 1906 and 1944. Use of the Rio Grande River in the US is regulated by the Rio Grande Compact of 1938 (wrri.nmsu.edu/wrdis/compacts/Rio-Grande-Compact.pdf), an interstate compact between Colorado, New Mexico and Texas. However, Rio Grande River water is over-appropriated, that is, there are more users for the water than there is water in the river. Thus, in 2001, Congress appropriated funds to support the the Rio Grande Initiative (riogrande.tamu.edu/background.php). Because of the dual effects of drought and overuse, the section from El Paso downstream through Ojinaga was recently named “The Forgotten River.” And in the summer of 2001, for the first time in recorded history, the Rio Grande failed to empty into the Gulf of Mexico. In 2006, the river once again started intermittently reaching the Gulf of Mexico. However, ecologists fear that unless rainfall returns to normal levels during the next few years and strict water conservation measures are adopted by communities along the river, the Rio Grande River may soon become extinct. The Colorado portion of the Rio Grande Basin includes about 8,000 square miles and makes up Colorado Water Division 3 (Figure 2). The Upper Rio Grande River, with a drainage area of about 35,000 miles, flows through the San Luis Valley, an open, almost treeless, intermontane basin bounded by the San Juan Mountains on the west and the Sangre de Cristo Mountains on the east. The San Luis Valley is 90 miles from north to south and 50 miles from east to west. Average elevation of the San Luis Valley is 7512 to 8000 feet. Although the mountainous areas may have average annual precipitation over 40 inches, mean annual precipitation in the San Luis Valley ranges from only 7 to 10 inches, and hence, it is true desert. The northern portion of the basin (approximately 2,700 square miles) coincides with the “Closed Basin,” an internally drained area that includes about two-thirds of the San Luis Valley. Irrigated agriculture is the largest water user in the basin and consumes about 85-90% of water used. The approximately 600,000 acres under irrigation are supplied by conjunctive use of both surface and groundwater. Major crops are potatoes, barley, vegetables, and alfalfa. Most irrigation water comes from managed recharge and pumping of unconfined-aquifer wells. An average of 2 million acre-feet of water is used annually in the basin, of which 800,000 acre-feet is from groundwater sources. About 3,500 of the 6,500 wells in the basin with greater than 50 gallons per minute (gpm) capacity are now in use (Colorado Water Conservation Board, 2002). The Upper Rio Grande has a longer history of water shortages and disputes, and of treaties and decrees and compacts to settle those disputes, than any other river in the Southwest. A severe water shortage in Mexico, Texas and southern new Mexico in the 1890’s was attributed to mainly to increasing development and use of water for irrigation in the San Luis Valley during the preceding decade. This water shortage, which also could have reflected below average precipitation, was responsible for the “embargo” of 1896 and also for the Rio Grande Convention of 1906 “embargo” was an order from the US Secretary of the Interior which prevented further irrigation development of any magnitude in the Rio Grande Basin in Colorado and New Mexico; it was not lifted until 1925. Under terms of the treaty of 1906, the US guaranteed an annual delivery in perpetuity of 60,000 acre feet of water in the Rio Grande at the head of the Mexican Canal near El Paso, Texas. In keeping with the ongoing concern over water in the Upper Rio Grande, long records of streamflow are available for many places along the main stem and its principle tributaries. However, the data concerning groundwater supplies are extremely meager. Administration of water in the upper Rio Grande Basin is governed by Colorado state law and by the Rio Grande Compact. The Rio Grande Compact of 1938 establishes Colorado’s obligation to ensure deliveries of water at the New Mexico state line and New Mexico’s obligation to to assure deliveries of water at the Elephant Butte Reservoir. As salinity has long been a major water-quality problem throughout the Rio Grande Basin, the compact also sets a minimum water quality standards: for example, sodium ions and total dissolved solids in the water must not exceed 45% and 350 ppm, respectively. The Rio Grande Compact Commission in El Paso, Texas, administers the terms of the Compact. It is important to note that in all parts of the basin, the natural streamflow has been modified by man to such an extent that there are few places where streamflow can be computed reliably from existing hydrologic records. These modifications include changes in diversion, reservoir storage, irrigated acreage, drainage of surface water, changes in vegetation cover, and changes in groundwater storage. The upper Rio Grande Basin is one of 9 areas in Colorado covered by “roundtables.” Representatives of several stake-holder groups attend regular meetings of the (Upper) Rio Grande Basin Roundtable meetings. These include Ray Wright, who represents the basin on the statewide Roundtable, Mike Gibson, chairman of the basin roundtable, Steve Van Deveer, manager of the Rio Grande Water Conservation District, John Sanderson, of The Nature Conservancy, and representatives of the San Luis Valley Wetlands Focus Area Committee. Average total basin inflow of native water is about 1,576,000 acre feet, with another approximately 4,000 acre-feet of imported water. Total basin outflow was 278,000 acre-feet in 1970 and 325,000 acre-feet in 1993. In 1992, irrigated acreage was 452,700 acres and water loss due to irrigation consumptive use and associated consumptive reservoir and conveyance losses were 617,000 acre-feet. Irrigation in the lower reaches of the Rio Grande has caused elevated dissolved salts and suspended sediment concentrations. Usually by mid-July native flows in all of the basin streams have dropped to the point that only the most senior water rights have water available to them. Then, reservoir releases provide supplemental water. The Rio Grande and Conejos Rivers are on call year-round from water rights calls and/or the Rio Grande Compact. About 18% of the annual flow delivered from Colorado to downstream users comes from the Franklin Eddy Canal, a 42-mile canal on the east side of the San Luis Valley that is fed by some 160 high-capacity, unconfined aquifer wells and delivers water to the Rio Grande River to the south. The Franklin Eddy Canal is maintained by the Bureau of Reclamation. Figure 3. The “Closed Basin” of the Upper Rio Grande Basin is dotted with some 48 lakes under the present climate regime. Aquifer Facts- Who Owns The Water? Figure 4. Schematic diagram showing water table, an unconfined aquifer, a confined aquifer, wells, and potentiometric surface (level to which water would rise by the force of hydraulic pressure in a confined aquifer). 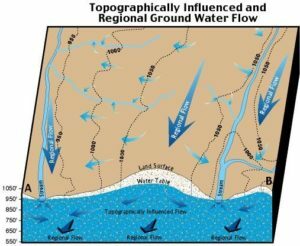 The unconfined aquifer occurs in the upper 40 to approximately 180 feet of unconsolidated alluvial sands and gravels. Here, concentration of dissolved solids ranges from 52 to 13,800 mg/l, with the high values due to over-irrigation and concentration of salts and alkali near the surface. A blue clay layer forms its base, such as shown in Figure 4. 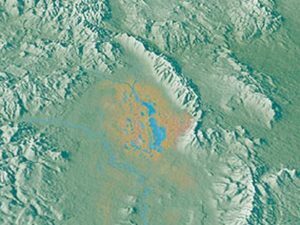 The blue clay consists of lacustrine clays of Lake Alamosa (dating about 3.7 Ma to 440 ka) and is found at depths ranging from 10′ to 1000.’ Beneath the BNWR and the Baca Grande community, the blue clay occurs at depths of greater than 100′ to greater than 130′. 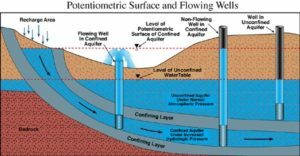 The unconfined aquifer yields up to 1,500 gallons per minute (gpm) on the west side of the valley and 50 to 700 gpm in the central and eastern parts of the valley. The water is generally potable, but nitrate, sodium and dissolved salts are unacceptably high in local areas of the central part of the valley due to water-logging of the soil from excessive irrigation. The confined aquifer is thought to be 500 to about 14,000 feet thick. Thickness of potable water averages about 2,000 feet across most of the San Luis Valley, where concentrations of dissolved solids range from 70 to 437 mg/l. So the quality of confined aquifer groundwater is typically much greater than that of the unconfined aquifer (where total dissolved salts, tds, range from 52 to 13,800 mg/l). At about 2200′, the water is too briny for agricultural use or drinking water. The confined aquifer occurs in alluvial sands and gravels in its upper portion and sandstone and fractured volcanic rock in its deeper portions. Yields of from 50 to over 3,000 gpm in the southern and western parts of the valley are typically acceptable for potable use. Although hydrologists typically use a model postulating five blue clay layers (aquitards), geologist Dr. James McCalpin speculates there may more like 30 in the San Luis Basin. Right now, it is said that the State of Colorado owns most of the water rights to the confined aquifer. However, two recent court cases could have a large effect on how groundwater in the SLV is utilized and by whom. In Water Court Case #04CW24 (1972), the Colorado State Engineer has determined that the confined aquifer is now fully appropriated and has placed a moratorium on new water appropriations from non-exempt confined aquifer wells since 1972 and on non-exempt unconfined aquifer wells since 1982. In Water Court Case 04CW35, the Great Sand Dunes National Park and Preserve has, in the summer of 2008, been granted dominion over all unallocated water under the National Park. Water in aquifers moves and mixes. One must assume the general flow of subsurface water in the unconfined aquifer is downhill and toward the south as per Figure 5. Figure 5. Regional flowlines of aquifers, based on gradient and hydraulic pressure. One must also assume that basin-fill sediments that form the aquifer systems in the San Luis Valley are hydraulically interconnected with each other as well as with the alluvium of the Rio Grande and its tributaries in the valley. 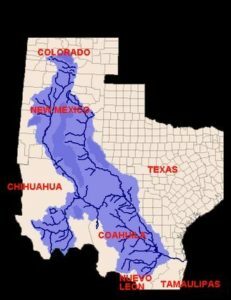 Does the “Closed Basin” constitute the headwaters of Rio Grande River? Lake Alamosa and the Rio Grande sucker, Rio Grande chub, and Rio Grande cutthroat trout say yes! Certainly, over geologic and recent time, the “Closed Basin” forms the headwaters of the Rio Grande drainage basin as shown in Figure 2. 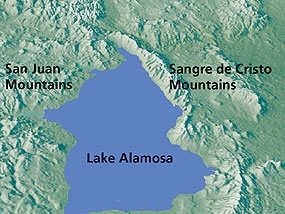 Between about 3.7 Ma (million years ago) and 440 ka (thousand years ago) most of the San Luis Valley was under Lake Alamosa, and this lake drained to the south into the Rio Grande River. According to Dr. Mike Machette of the U.S. Geological Survey, geomorphological features, including shorelines, spits, lagoons and barrier islands in the San Luis Hills, indicate that a basalt lava flow blocked the south-flowing Rio Grande River, impounding water in the San Luis Valley to form Lake Alamosa. This lake was three times the size of modern Lake Powell, extending north to south about 62 miles (from the present Mineral Hot Springs to La Jara) and 25 miles east to west (from Blanca to Monte Vista) (Figure 6). Lake Alamosa was 150 to 200 feet deep and spilled into the Rio Grande River to the south until about 450,000 years ago, when it finally drained completely into the Rio Grande Canyon, causing canyon-incision to the south. Thus, we see that for most of the past approximately 4+ million years, the San Luis Valley formed the northern headwaters of the Rio Grande River system. Machette also noted that whereas most hydrologists recognize about 5 “blue clay layers” in San Luis Valley sediments, there are probably more like 30 separate clay layers (aquicludes) in the valley. In 2005, the Colorado Division of Wildlife (CDOW) found the Rio Grande sucker (Catostomus plebeius), the Rio Grande chub (Gila pandora), and the Rio Grande cutthroat trout (Oncorthynchus clarki virginalis) in tributaries to the Rio Grande River in the northern San Luis Valley. 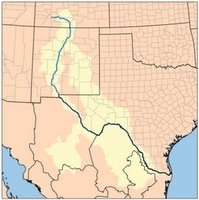 The Draft Environmental Assessment for the proposed Lexam drilling states: “Historically, (the Rio Grande sucker) was found throughout the Rio Grande river system. In Colorado, this species is now limited to several small tributaries of the Rio Grande River…. in Crestone Creek, Hot Creek, and McIntyre Springs… This species was documented near the project area in 2005 by the CDOW in Crestone Creek and laterals (tributaries) in the project area (CNHP- Colorado National Heritage Program, 2006).. Occurrence of these species in the northern SLV indicates that the so-called “Closed Basin” is not closed, but rather, still forms an integrated part the Rio Grande drainage. In addition, it should be noted that the Rio Grande sucker is recognized in Colorado as an endangered species. The documentation of this endangered species in the project area should suffice to stop the proposed Lexam drilling altogether. As noted above, the quantity of recoverable (potable water) in the San Luis Valley has been estimated at over 140 million acre feet (Pearl, 1974). The quality of water in the San Luis Valley is generally excellent, except where overuse of irrigation has caused buildup of salts and alkali. However, Evelyn Veehill of the Sangre de Cristo Lab in Alamosa notes that extremely high levels of methane gas are commonly encountered in water samples from the confined aquifer in wells between Alamosa and Moffat on the east side of Highway 17. The Draft EA also reports readings of between about 7 and 26 mg/l of methane in water samples in 10 of 21 wells for which data are available. Vehill notes that water with about 10 mg/l is considered ignitable and that samples with 20 mg/l are considered saturated with methane. Above that level, machines cannot measure the amount of methane accurately and samples must be diluted in order to get accurate readings. Vehill also notes that for water to safe for drinking it should have no odor, color, smell, or taste. Methane concentrations need to be near zero. Water with high levels of methane, by contrast, appears to foam like beer and is often gold in color. Ms. Vehill notes that in about 2003, a brand new house between Alamosa and Mosca exploded and was destroyed after methane that had accumulated in its plumbing ignited. She also noted that a number of families in the Mosca area heat their homes from the gas that comes along with their water! Analysis of snowpacks in the Rio Grande Basin on April 1, 2006 indicate snowpack ranged from 69% of average in the Upper Rio Grande Basin to only 9% in the Jemez Basin. Spring runoff forecasts for April, 2006 called for about 30% of normal streamflow response to this melting snowpack. Between relatively wet years of 1995 and 2005 were nine years of consecutive drought. The Rio Grande silvery minnow is a species of fish living in the Rio Grande River which is on the endangered species list. Its historic range was from Espanola, New Mexico to the mouth of the Rio Grande in the Gulf of Mexico. Threats to the silvery minnow include prolonged flow diversions, channelization and regulation of river flow to provide water for irrigation; diminished water quality caused by municipal, industrial and agricultural discharges; and competition or predation by introduced non-native fish species. Western riparian areas and wetlands have great significance as wildlife habitat because of the arid climates in which they are found. Although riparian areas comprise a relatively small percentage of the land in the Southwest, over 70% of all species inhabiting the region, as well as many migratory species such as birds, depend on riparian habitats. Although Western riparian areas typically have a greater significance than wetlands and riparian areas elsewhere in the US, riparian areas in the West often do not qualify as wetlands for purposes of regulation under the Clean Water Act. Recent estimates are that some riparian areas have declined by as much as 90 to 95% in the West. Because the silvery minnow is listed as an endangered species, the US Fish and Wildlife Service is charged with maintaining in-stream flows if necessary to protect it. How ironic then, that in letting the Lexam drilling project go forward, the Baca National Wildlife Refuge is allowing both the reduction in quality and quantity of surface waters that feed the Rio Grande River. In addition, the pumping of vast quantities of saline, sodic water from the confined aquifer would further poisoning surface water in the headwaters of the Rio Grande River. Colorado Water Conservation Board, 2002, Rio Grande Basin Facts. 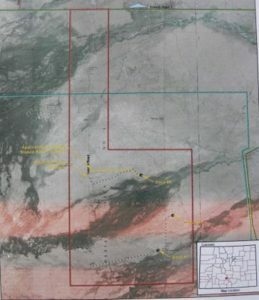 ENSR, (private contractor paid by Lexam Explorations, Inc.), 2008, Draft Environmental Assessment of Planned Gas and Oil Exploration, Baca National Wildlife Refuge, Saguache County, Colorado. Rio Grande Water Conservation District: Steve Van Diveer, 10900 E. US Highway 160, Alamosa, CO 81101. Phone: 719-589-6301, fax- 719-589-4331. Saguache County Director: David Graham, Vice President: George Whitten, Jr.
Rio Grande Compact Commisison: Honorable Patrick R. Gordon, Rio Grande Compact Commissioner, P.O. Box 1917, El Paso, TX 79950, phone 915-834-7075. Legal: Prescilla Hubenak, Office of the Attorney General, P.O. Box 12548, Austin, TX 78711, phone: 512-463-2012. Middle Rio Grande Conservancy District: Public Information Officer,Dennis Domizalski, 505-247-0234x 1342, 1931 Second St. SW, Albuquerque, NM 87102, Mailing Address: P.O. Box 581, Albuquerque, NM 87103, or David Gensler, Hydrologist, 505-247-0234 ext. 1361. U.S. Bureau of Reclamation, Upper Colorado Regional Office; Ella Mae Herrera, 10900 Highway 60 East, Alamosa, CO, 81101, 719-589-5855, 125 South State Street, Room 6107, Salt Lake City, UT 84138-1147 (801-524-36030, Albuquerque Area Office, 555 Broadway NE Suite 100, Albuquerque, NM, 87102-2352 (505-462-3540), Western Colorado Area Office, 2764 Compass Drive Suite 106, Grand Junction, CO, 81506, Grand Junction, CO 81506 (970-248-0600). Colorado Water Conservation Board: 1313 Sherman St., Room 721, Denver, CO, 80203, 303-866-3441. State of Colorado- Division of Water Resources: (Division III)- P.O. Box 269 301 Murphy Drive, Alamosa, CO 81101, 719-589-6683.